1. The best thing to come out of yesterday’s Anderson Cooper / Dyngus Day flap? The Buffalo Outrage Twitter account. Check it out next time Buffalo gets indignant over real and imagined slights from national figures. I’d like to note that the point I made in my post about it yesterday – about my misgivings over the geography of the Dyngus Day festivities – was underscored by the fact that the Dyngus Day organizers held their faux-anger-at-Anderson press conference at Redlinski’s, which is not in the Broadway Market anymore, but instead located on Walden Avenue in Cheektowaga. I was pleased that the organizers didn’t overdo the outrage, and instead took it all in good humor and invited Cooper to the 2013 festivities. As for the geography, upon some reflection, I do enjoy the use of the Central Terminal as Buffalo’s unofficial convention center – the convention center that is architecturally gorgeous and begging to be used. But parading through a devastated community that hasn’t been Polish for decades still seems borderline insulting, and that’s what I object to. If Polonia is so great, why’d all the Poles move? 2. What happens when a cow walks into the road and causes an accident – can the cow’s owner be held liable for negligently allowing the cow to roam around freely? Not in New York, and the Third Department’s Appellate Division took an unusual step and referred a case to the Court of Appeals, asking the state’s highest court to change the law. 3. George Zimmerman, who shot and killed unarmed teenager Trayvon Martin was charged yesterday with 2nd degree murder. The case is rapidly becoming something of a circus, complete with the involvement of despicable judgment debtor Al Sharpton. At its core, however, the question of whether Zimmerman’s killing of Martin was justified is one a jury should decide – not the police. In Florida, 2nd degree murder does not require premeditation; instead, a person is guilty if he commits a homicide, “with a depraved mind showing no regard for human life“. To my mind, when Zimmerman made the decision to exit his car to chase Martin – who was not committing any crime – he forfeited any right to a self-defense justification. Being black, wearing a hoodie, and looking at the overzealous neighborhood watch guy funny don’t justify homicide. 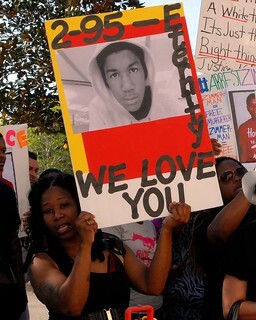 Either way, both Trayvon Martin and George Zimmerman deserve this to be a fair trial by an impartial judge and jury. Paladino also criticized Romney for his offshore investments, which the Washington Post reported yesterday still aren’t fully known, because the campaign is utilizing an obscure exception in federal ethics laws. Paladino is on a kick to grow his power statewide, and I don’t recall him using such colorful terminology on the record when dealing with local or regional matters. Part of me thinks it’s too bad, because that sort of language is seldom appropriate, but never more so than when talking about our local political establishment. 5. Thursday in at the Square will be permanently moving from Lafayette Square to Canal Side. More room, nice location, something to do by the water – everybody wins. 6. Adding to the groups the Republican Presidential nominee is happy to alienate and offend, the homophobic National Organization for Marriage endorses Mitt Romney for President. NOM’s Twitter account was hacked yesterday, with hilarious results. 7. I just saw the first pro-Romney SuperPAC ad on Channel 4, from the “Restore our Future” PAC, so named because apparently Kenyan Indo-Muslim Socialist Usurper N0bama has taken it away. 8. The right wing hates not only Obamacare, but also Social Security. The 2008 financial meltdown apparently taught them nothing at all. 9. Turns out, James O’Keefe’s and Hannah Giles’ prostitution “sting” of ACORN wasn’t too far off the mark – problem is, Andrew Breitbart was the pimp, and O’Keefe and Giles were the whores. 10. Here is Anderson Cooper putting himself on the Ridiculist after yesterday’s giggling fit over Dyngus Day. It’s nice when people can have a sense of humor.